Of course you know that given the choice cats would not drink much water at all. In the wild, they get their fluids from the raw meats and fish they consume. Dehydration is very serious in cats, so we need to do everything we can to encourage water consumption. Running water is very soothing to cats, and it encourages them to drink. 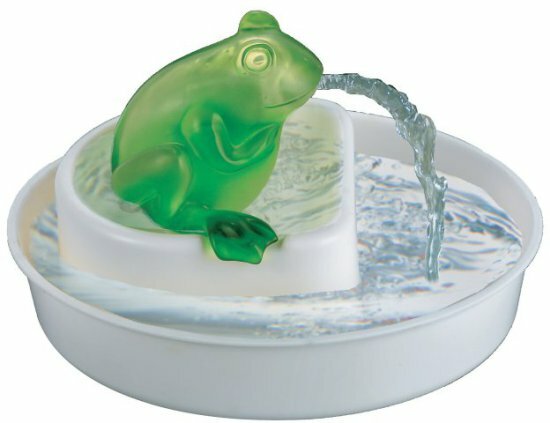 Instead of wasting the water in your bathroom sink, try an adorable Frog Watering Hole Fountain. Sounding like an outdoor stream, Cats Rule's Frog Watering Hole Fountain may be soothing for you and kitty, and the frog creates a visual of a creek or brook running through the hills of Virginia, perhaps. 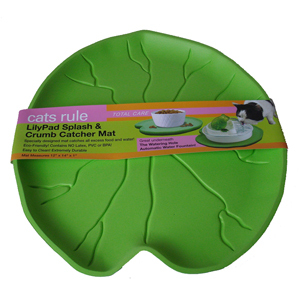 Cats Rule also makes a Lillypad Splash and Crumb Catcher that allows you to complete the idyllic image, while your cat keeps his water and food off the floor. The Watering Hole Fountian is made of food-safe plastic resin and has a liquid capacity of 1.2 quarts or 1.14 liters. It comes completely assembled with 2 active carbon filters. Each filter lasts 4 - 6 weeks, depending on how many cats (or small dogs?) are lapping up the water. You can purchase the Cats Rule Frog Watering Hole Drinking Fountain from Amazon.com. Also available from the site are extra Fountain Filters and, of course, the Lillypod Splash and Crumb Catcher is a must to match! Gibbon Taunts Tiger! The Animal Video of the Day!! !